Time is of the essence for people in on the go. Whether they are on the way to school, having a drink at the coffee shop, or pumping gas at the gas station, documents need to be printed. Gain new customers and generate more revenue by providing cloud-based public printing solutions for people on the go. ePRINTit has the most powerful cloud processing system in the world, available where and when business happens. Expand your business offerings across the board and provide the conveniences of home for your customers so they feel comfortable wherever they are. This software provides higher education or account based printing software designed for higher education and K-12, air offices, libraries, brokerage or franchise firms etc. ePRINTit Account Managed Services software is specifically designed for any location that wants to assign specific and controlled monetary payments and tracking of all print and scanning within a controlled environment. All documents use a Universal print driver technology that stores, encrypts and sends a compressed PDF formatted document or image file. The solution provides Active Directory and SSO Mobile APP’s specific to your account and touch screen software to print preview only your print cloud account. Users can manage their funds on the convenient web portal or mobile APP’s or at the release stations. This software is designed for print franchises and copy shops, post offices, convenience stores, coffee shops, hotels, motels, vacation spots and air rentals, libraries, gas stations, rest stops, government services etc. The ePRINTit software provides a convenient and secure solution for all anyone using various mobile devices on multiple networks. Global branding and geo-location software make it easy for people to use many mobile APP’s such as ePRINTit or HP ePrint Mobile APP’s and Desktop driver solutions. Full Credit/Debit charging API available to connect to your payment processor or management system or let us manage that all for you. Customers easily receive their print request by sending their attached documents through our mobile APP’s or by email or on our web portal and receiving an 8-digit secure release code. With more than 28,000 locations world-wide there is a place for you to print such as FedEx Office or UPS Office Stores. Both solutions ensure documents are hyper secure and are device or printer agnostic. ePRINTit also provides integrations into secure print management software like UniPrint Infinity, extending all the benefits from their unified platform. The only solution providing print preview and selective options on multiple different print jobs at the same time. Dramatically reduce your cost of printing and print management with NO print Server, No printing without the user at printer, selective options and defaults at printer and pay for use for guests and students. Dramatically reduce your environmental footprint by eliminating the need for home and personal printers and public computers. Join the shared economy and save. 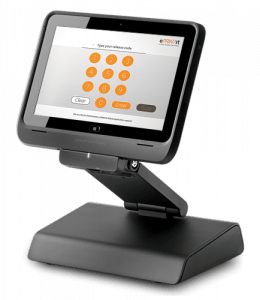 The Web Portal – The school or retail branded ePortal includes management reporting and a private portal for job storage that tracks their expenses. Users can manage their own account, upload documents, run detailed reports and add funds to their account. The eprintitservice.com website allows anyone to search for and send documents to any ePRINTit location in the world. Mobile App – Users can use the ePRINTit Public Mobile APP (Android | iOS) or the ePRINTit Campus Mobile APP (Android | iOS) for AD Integration to access their own private, branded application from their mobile, tablet or desktop. 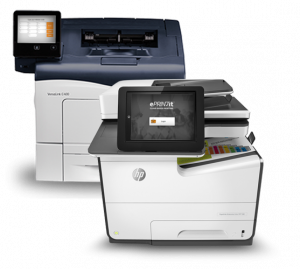 Users at all locations can also use the HP ePrint mobile APP and choose nearby locations. They can also deposit funds directly to their account and can select files to send to the print kiosks. Available for free on all APP Stores. User Email – Users can send files from their school email to an eprintitservice.com email address to receive the files in their accounts to manage and quickly print from ePRINTit kiosks. Public Locations will have an email address allowing users to print using a secure release code. File to Print – Schools can use our specially designed file-to-Print driver solution for Public and Private computers. Users authenticate when job is sent to their private cloud and retrieved form any printer. USB Drive – Students can access and print their documents from the closest print kiosk via their USB drive with the Campus software solution. HP OXP Printer Release Station (embedded in the HP Printers using OXP). 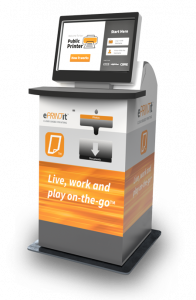 ePRINTit Kiosk Station or PC release station attached to any MFP or Printer. Tablet Release Station using windows 10 wired or wirelessly linked to any default printer.